Our garage door system offers the best insulation in the market. It conserves energy and saves money by way of numerous thermal breaks. This ensures chill-free winters and cool summers in both garage and home. 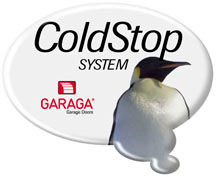 When shopping for a garage door be sure to insist on all the ColdStop features you get with a Garaga garage door system. You will feel the difference.